I’m so excited to be joining in on Marigold from Hideous! Dreadful! Stinky! ‘s Summer of No Pants series again this year. If you aren’t familiar with the series it’s packed full of tutorials, round ups and giveaways to help us get our skirt and dress on over the Summer and get out of ahem the yoga pants. 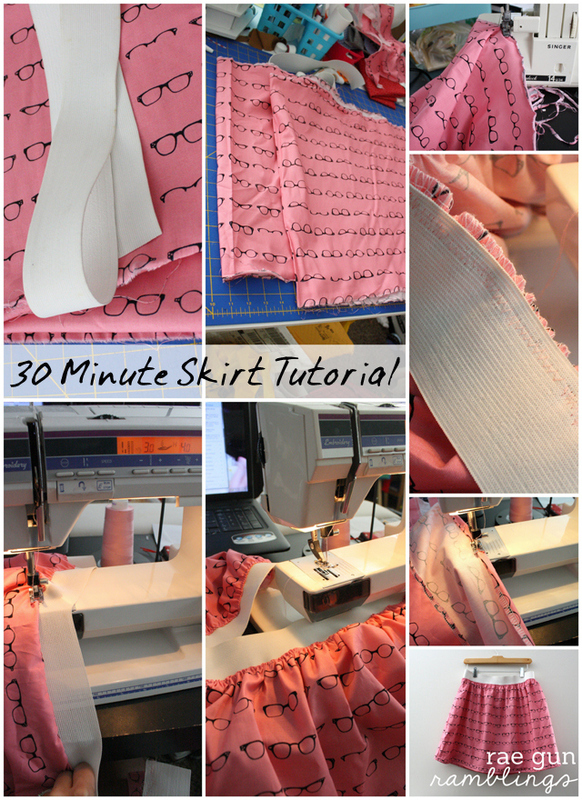 Today I’m excited to share my super fast 30 minute skirt tutorial. My favorite part is that it only uses 1 yard of fabric and little elastic. 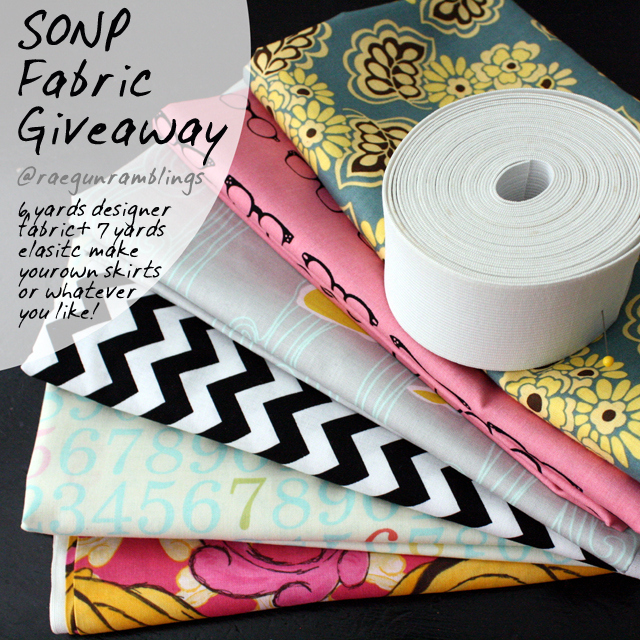 Also to help encourage the fun I’m giving away a big bundle of designer fabric and elastic. 6 yards enough to make 6 new skirts or whatever else you want to make out of the fabric! You’ll need 1 yard of fabric and about a yard of wide elastic (this depends on your waist size). First prep your fabric so you have two pieces that are each 22 x 36 inches. I just tear mine along the fold from the bolt. Then sew the one short side of each piece to each other right sides together so it makes one long skinny piece. Finish the long edges either on your serger or with a zig zag stitch. Cut your elastic 5-6 inches SHORTER than your waist measurement. You want it to stretch or it will feel like it’s falling off. Mark the center of your elastic and try to stretch it the full length of your fabric piece. You may have to use some muscle. If you can’t stretch it the full length cut even amounts off both ends to however long you can get the elastic to go (I did have to trim my fabric). With the right side down stretch the elastic and zig zag the fabric onto the elastic. Then fold the fabric down so the right side of the fabric is up and while stretching the elastic use a zig zag stitch to top stitch the fabric. With right sides together sew up the skirt so you have a tube. Finish the hem how ever you like. I just did a simple narrow hem by rolling the fabric under twice. Easy peasy. And then the final step is to take incredibly awkward pictures of yourself with the camera self timer. But really I am a big fan of the skirt I wore it out and about all day and I had a bunch of people compliment me on it. And all this with a super easy to make and easy to wear comfy skirt. And be sure to hope on over to check out all the other awesome SONP posts! LOVE the print you used for your skirt! Thanks for the giveaway! Love the skirt fabric and the number fabric is darling! I am IN love with fabric and I love this skirt. SO CUTE! Love the skirt! Thanks for the chance to win! That fabric is awesome! Thanks for the tutorial! Looks cute. Do you do in home lessons? Cause there is no way I could do that on my own! quick question, I cannot figure out how to easily do anything on instagram from my computer, do I need to do those parts from my phone? SORRY! Cute skirt! The fact that it takes 30 min to make is tantalizing but sewing is not my forte and every project takes me at least 3x as long as the directions estimate. Beautiful fabrics!! The skirt skirt looks amazing…love the glasses! Your skirt turned out so cute. I love the material! Stupid iPhone autocorrect hates my name. Grrrrrr KAT! Love the skirt. Thanks for the giveaway. Love the tutorial! The skirt is adorable in that fabric. Super cute skirt, and thanks for the tutorial. I love the fabrics you picked out for the giveaway. great fabric bundle! the challenge sounds very intriguing. Alright. Im JUST LEAVING A COMMENT! ;-) However, I will elaborate and say that I had NO CLUE about the Summer of No Pants… Time to get sewing. I really want to win some fabric! Yay! 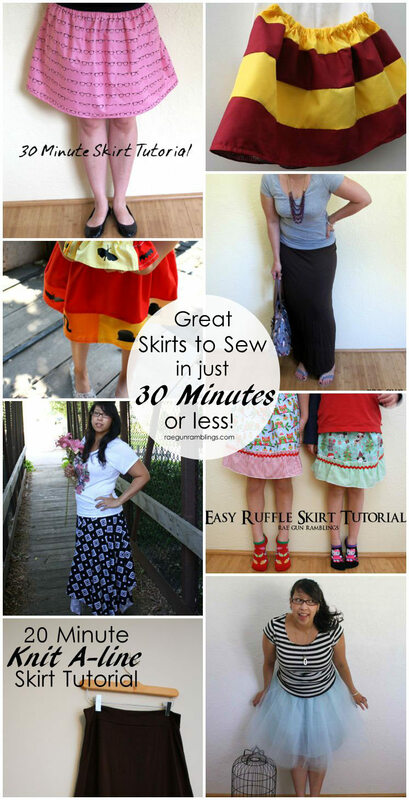 Would love to be able to stitch up some cute summer skirts – great giveaway! I LOVE to wear skirts in the summer. I must make this one soon. Great fabric choice. Love, love it! I recently started sewing and this looks like the perfect project to help me perfect my sewing. Thanks so much for the tutorial and giveaway! I’m in LOVE with that fabric of your skirt!! I’m obsessed with making skirts this year, I’ve made a few for my toddlers and myself and my sister. So cute and simple! Love the fabric choice. No reason to wear pants with skirts like that! I’m loving the bicycle fabric!! What an awesome giveaway! I would’ve entered more, but bloglovin always kicks me out of giveaways. I use their iPad app- hate it! If I have time I’ll get over in the PC and enter some more- because id die to win all that great fabric! Thanks hon! Thank you for the tutorial. I’m totally going to make one! As a librarian, that fabric with the glasses just kills me. I love this! I love your fabric choice and tutorial! Awesome giveaway- girl can never have too much fabric! Oh fabric! How I love thee!! Such lovely fabric! I have wanted to try to make these type of skirts for a while now. Thanks for the giveaway! Pick me! Love the fabrics! Those look like very fun fabrics! I am so in love with that skirt!! It’s adorable! Those fabrics you are giving away are amazing too. Yay! Super cute skirt and material :) thanks for the giveaway! What fun prints! I love the idea of wearing skirts all summer too! Love the skirt. Quick and easy. That’s what I like. Thanks for the giveaway. What a great give away. Love this bundle of fabric. this material is just too cute!!!! I love this skirt and all of these fabrics would make such cute skirts too! Adorable! My daughters LOVE wearing skirts too! Thanks for the chance! Really cute fabric…I might have to start wearing skirts! Love how easy this skirt is to make! Great tutorial and it is nice to have you model the skirt so we can see how it looks. Looks great! Super cute fabrics! Thanks for the giveaway! What a great and easy tute! Thanks! Thanks for the generous giveway also. So fun! A great giveaway and a great summer skirt! Lovely skirt, thanks for thr giveaway! Cute skirt and the chance to win some pretty stash! So cute! This will be great for summer skirts for both my daughters. Thanks for the great tutorial. Ooooh, I love quick and easy skirt patterns! Thanks for posting this tutorial! Super super cute skirt and fabric :) Thanks for the tutorial!